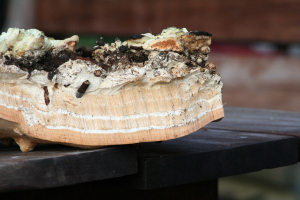 This fungus is growing inside a dead felled Horse chestnut. The tree has been cut up prior to being used as firewood.I first saw the fungus on the 11th October,I posted it on I-spot on that date.The tree was about 150 years old, and had died; many jackdawa had been nesting in the tree.Thee tree trunk had been cut in circles. On one of the cut circles the fungus was showing.It was completely surrounded by wood, although the centre of the trunk was hollow. The fungi has a white upper surface, abit knobble, the pores arean orangy-brown, about 4 or 5 to the mm.It is fan shaped,60cms wide by about 40cm,at least 10 cm at its thickest and 3cm at its thinnest. From the photo you can see at least four different growth of rings. The spores seem to be a shiny brown(but I am not certain of this. I have been to the tree today, I can see another bracket growing, but cannot get to it to photograph it.